In the Middle Ages, the so-called Royal House that was the seat of an important economic institution - the Royal Chamber stood in the place of the present Premonstratensian church. At the beginning of Recatholization, at the turn of the 16th and 17th century, a dwelling and a chapel were established here for the Jesuits, "missionaries" in a Protestant town. In 1619, three of them were tortured to death by soldiers of György I. Rákóczi. They are the well-known Saint martyrs of Košice: Marek Križin, Melicher Grodecký and Štefan Pongrác. The murder shocked the town and later on the wife of György II. Rákóczi bought the real estate and arranged theconstruction of a church for the Jesuits inspired by the famous "Il Gesu" in Rome on the ruins of the former Royal House. The church was completed in 1681. 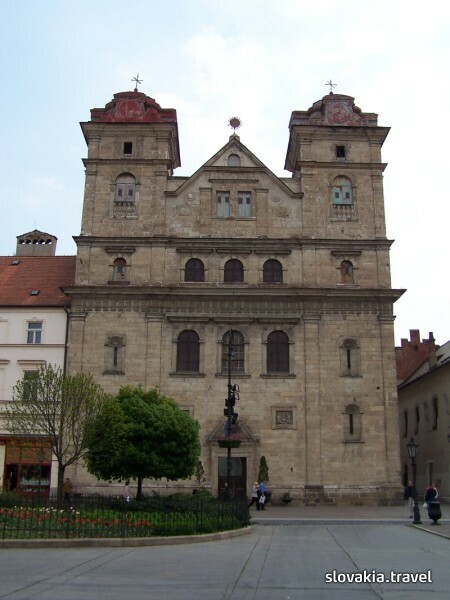 The Jesuits established schools near the church and the first University of Košice, that was the second University in the whole country at the time, was also established there. That is why the church is sometimes referred to as the Grammar School church or the University church. In 1811, the church was given to the Premonstrates. The decorations and the furniture mostly date back to the Jesuit period. The interior has the air of high value and simplicity. For instance, there is a perfectillusive painting of 1786 by Erazmus Schrott. There are also valuable painted altars of side chapels and rare carvings on the pulpit, pews and other parts of the interior. The donor and the founder of the church, princess Sophia Báthory, and her son Francis are buried in the crypt that was to serve as the burying place of the Rákóczi family.